← Helen Thomas Rides Again; She Wants to Know, WHY Terrorism? This story begins with several fictional Turkish television dramas that had critical things to say about Israel. It ends with an apology from Israel for its overreaction to that criticism. In one episode of the Turkish television series, “The Valley of the Wolves,” BBC reported that an Israeli soldier takes aim at a smiling young girl and kills her. Another clip from the series – which tells the story of a Palestinian family -reportedly shows a bullet fired by an Israeli soldier traveling in slow motion toward a Palestinian child. 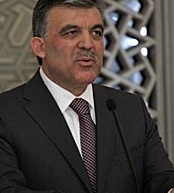 Before these programs were aired, Turkey’s prime minister had been openly criticizing Israel for the excessiveness of its 2008-2009 military invasion of Gaza. Israel’s foreign minister, Avigdor Lieberman, figured this was his chance to protest Turkish television programs, while, it may be assumed, exacting some revenge on an official of the Turkish government. Lieberman instructed his deputy foreign minister, Danny Ayalon, a former ambassador to the US, to stage an especially humiliating confrontation with Ahmet Oguz Celikko, Turkey’s Ambassador to Israel. Ayalon, an unlikely player in such a stunt, demanded that Celikko come to a meeting in the Israeli foreign ministry. Ayalon played his part too well. He made sure photographers covering the meeting knew this was the photo op that would demonstrate to the world that nobody messes with Israel. 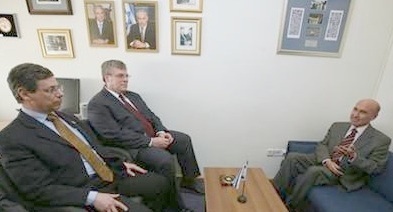 The AP reported that at the start of the planned humiliation meeting, Ayalon, speaking in Hebrew, instructed the Israeli photographers to capture the meeting from an angle that would show the Turkish ambassador seated on a sofa that placed him lower than Ayalon’s chair. On the table separating the two diplomats, there was no Turkish flag, only a small Israeli flag. This staged photo op had all the insensitivity and immaturity of the sort of scene Danny Anylon might have seen in a US television drama in which a group of teenage girls deliberately humiliate the new girl in school. The photo op was a huge success. The AP photo (above) appeared in the Israeli press. Unfortunately, for Israel, Ayalon’s petty photo op stunt became an immediate diplomatic disaster. Israel has provided “hundreds of millions of dollars of military hardware to Turkey”. Israel and Turkey have conducted joint naval exercises. The Israeli air force trains over Turkish airspace. Then came the public humiliation of the Turkish ambassador in Danny Analyon’s office. Prime Minister Erdogan demanded an immediate apology from the Israeli government. The next day’s luke warm “sorry about that” Israeli response, angered Turkey even further. Prime Minister Erdogan spoke with reporters at the Ankara airport after returning from a trip to Russia. He said that his country had received the apology it “wanted and expected” from Israel over the dressing down of its ambassador. “I was told that we received the response that we wanted and expected in diplomatic terms. The letter includes an expression of apology”. Israel needs to maintain some semblance of good relations with Turkey, a Muslim nation with ties to both East and West. To maintain that connection, Israel forced its own Foreign Minister, and his deputy, to apologize. This was the sort of diplomatic backdown the US has been incapable of getting from the Netanyahu government. Come to think of it, how responsive has Israel been to US entreaties to play nice in this post-Gaza-invasion era? A partial freeze of Israeli construction in the West Bank? Forgetaboutit. A halt to house demolitions? Ditto. The UN Goldstone Report? The US Congress condemned it. The Obama White House was too preoccupied with compromising its health care bill to even notice. Moment, a Jewish magazine founded by Elie Wiesel and Leonard Fein in 1975, as “The New Magazine for America’s Jew,” recently published a strong defense of Judge Goldstone. The Obama White House has turned its back on Goldstone, but an Elie Wiesel founded publication, hasn’t forsaken him. Go figure. Then, there is the more recent case of a US journalist, Jared Malsin, who lives in Bethlehem. Malsin is currently scheduled to be deported from Israel this Sunday, January 17. Malsin (pictured at left) was originally ordered deported back to the US after he was refused entry at the Tel Aviv airport when he returned to his residence in Bethlehem, following a personal trip to Prague. Malsin’s father is Jewish. For more on Malsin’s background, click here. He is originally from New Hampshire and is an American citizen. He is a graduate of Yale University. He was initially questioned for eight hours by Ben Gurion officials. In the past ten years, as many as 225,000 Jews between the ages of 18 and 26, mostly from the US, have visited Israel, courtesy of Birthright Israel, a program whose free 10-day trips are designed to deepen Jewish identity. Malsin’s deeper Jewish identity led him in a direction which is not in Birthright Israel’s plan for its participants. He had his own vision of what he felt his Jewish identity demanded from him. 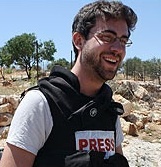 He went to work as the English-language editor of Ma’an, a highly respected Palestinian publication and online presence. Has Malsin been critical of Israel? You betcha. Here is a sample of his writing from November, 2007. Here is an interesting factoid about Malsin: He was never threatened with deportation during the Bush era. One year into Obama’s term, deportation looms. Could this be a clue to Israel’s current confidence that the Obama White House will be Bibi’s permanent good buddy? Malsin’s original deportation date was scheduled for Thursday morning, January 14. According to a Ma’an news report, “protests by US authorities in Tel Aviv resulted in a temporary reversal, and an injunction filed by Ma’an delayed the expulsion until an Israeli court reviews the case on Sunday, January 17. The nameless US authorities who were involved, no doubt, included the local American embassy. Nothing has been heard from the Obama White House. The New York-based Committee to Protect Journalists, which monitors freedom of the press worldwide. [The Committee] urged Israel to refrain from taking punitive action against reporters over specific content in their work. “Israel cannot hide behind the pretext of security to sideline journalists who have done nothing more than maintain an editorial line that the authorities dislike,” the organization said. American media has ignored the case of Malsin, except for this video report from the ever-reliable Amy Goodman, on Democracy Now. Take a look, it is less than one minute long. Click the middle symbol to access the clip. It is becoming distressingly evident that the Obama White House has aligned itself so closely to Israel that it has lost perspective on its partner in the Middle East. Does Barack Obama intend to turn his Middle East policy over to a nation that has turned its collective consciousness away from the values of its Jewish tradition? Before he signs a long term contract of undying friendship, the President would do well to read Larry Derfner’s essay in the Jerusalem Post, entitled “To Be Israeli Today”. Being Israeli today is about being against. Against Palestinians. Against people who criticize the way we treat Palestinians. Against Muslims in general. That’s it. That’s what it means to be Israeli, ever since the intifada started a decade ago and we concluded that no Arab could be trusted. Except for its hi-tech image, this is all Israel stands for anymore – being against this one, against that one and against anyone who isn’t against them, too. That doesn’t leave many people whom we’re with. We’re with Republicans. We’re with right-wing Evangelical Christians. And that’s about all. Everybody else is against us, or they don’t know anything about us, so they’re neutral. Like the Eskimos. And maybe those Shakers. . . . When I try to explain Israel to Americans, I ask them to imagine that 80 percent of their fellow citizens were Republicans. Israel has become a one-party country – the war party. We’re at war with the Middle East, with Europe, with liberal Jews in the Diaspora and with a pathetically small handful of dissenters at home. We trust no one. We see anti-Semites everywhere. We’d like to build an Iron Dome over this whole country to keep the world out. There’s very little oxygen around here; everyone is breathing the air that everyone else has exhaled. This country has been stagnating for a decade. And we’ve never achieved such unity. The picture at the top was taken by AP’s Gil Yohanan. The man in the middle is Naor Gilon, an Israeli Foreign Ministry official. I wonder, Jim, if Israel’s increasingly repressive activity, will lead more of the international community to conclude that Israel is going off the deep end and can no longer be defended. As you note, however, we are hearing precious little from the Obama administration about any of this. Pray Massachusetts votes Democratic on Tuesday, Health Care Reform is passed, and Obama can find the energy to refocus on other issues. To break that cycle, we must begin by comprehending that, “Israel is not a democracy, it is an ethnocracy: full rights to Jews, but not Palestinians.”-Jeff Halper, American Israeli, Founder and Coordinator Israeli Committee Against House Demolitions.